We make wooden cutlery tray of 450-600 mm and 600-900 mm size. Our rates are very competitive and product better than most of the available cutlery in market. We make Wooden Cutlery Tray of Steam Beech wood and MDF. It is 100% made in India product, our price is extremly low as compared to available wooden cutlery tray in market. They are highly over priced. Our rate is resonable and producy more durable than those big brands. 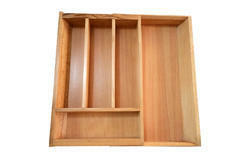 Looking for Wooden Cutlery Tray ?